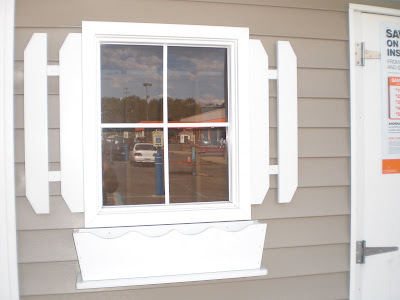 Last month I was in Home Depot to look at gardening sheds for ideas. All the wooden sheds at Home Depot are super cute, but at $3,000+ a pop, wow, it's pricey. Funny, I didn't take any photos of the entire shed, but bits and pieces of what I liked. Isn't this window, shutter and windowbox just adorable? I saw another shed that was also a greenhouse. On half of the shed roof, they had plexiglass windows to allow the sunlight in. What a novel idea. I so want this in my garden shed!! As we looked around, the hubs said he's going to build me one if I design it....(Big big smile) Have I ever mentioned on this blog how much I love my husband? I would like for us to try to build one for not only less than $3000, but one that is also "green". I'm looking into seeing if it's possible to maybe use reclaimed wood for the framing, recycled windows, recycled furniture etc. You get the idea. It might not be possible to do all recycled items but as much as we can would be great. It's not only wonderful for the environment but great for our pocketbook too. 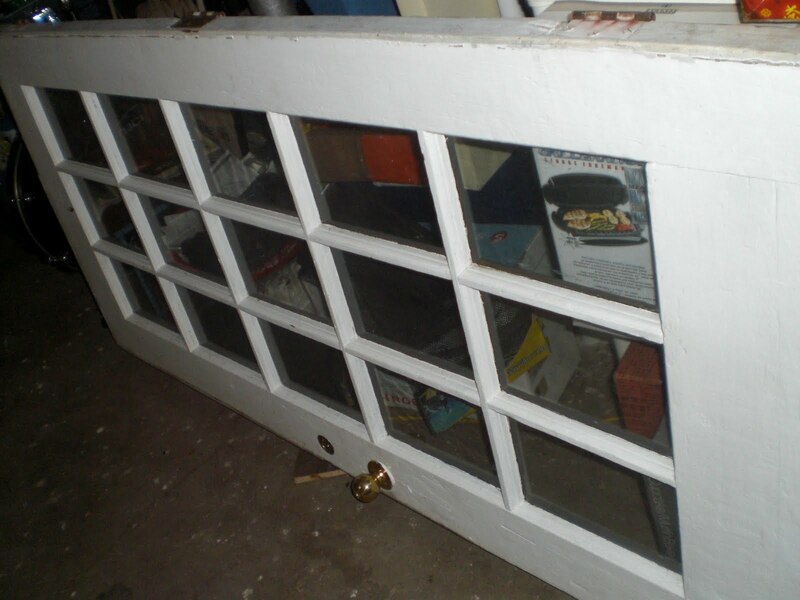 I already have this old glass door that we found in our attic that I plan to use. Isn't it just beautiful? We are guessing that it might be original to our house. I don't know, it's a guess. Our house was built in 1901 and this door is solid wood!! I'm hoping to start this project next year, but who can wait that long? That's really cool that you took pictures of parts of the garden sheds you liked. Keith and I have also admired many garden sheds sitting outside of our local Home Depot and Lowes, and gulped at the price tags. It would be really cool to design and build your own, and I'd be interested to know how cheaply, I mean, economically, you can make a DIY version. :) I admire your greenness, and that solid wood door would look great, I'm sure! Taking pics of just what you like is exactly what you need to do! I do that all the time, so I "don't forget"! I am sure you can come in way less than that HD price tag, and it will be even better. I'm all about the DIY, and to try to use reclaimed wood is a great idea. I have looked for reclaimed wood in my area with no luck, but maybe I am not looking in the right place. The door will be perfect, sturdy and still let light thru. Good luck and keep us updated. Be sure to document the whole process! I would love to see your design and then the finished product. I LOVE the door you have! I can't wait to see it as your garden shed / green house door! oooh, how incredibly exciting! I would love to design this thing! I love that idea of half the roof being made of plexiglass. Very cool! I can tell you from building mine that you can definitely build something as large as a store bought kit for less. It all depends on what stuff you can find. My garden shed is 12'x16' with windows all around. I can't wait to use it for growing plants this coming spring. Put in a lot of though about the kind of base and foundation you want. I went with a concrete post foundation and gravel base for drainage reasons (since water and plants go together), but a solid wood floor is much easier to put together. Let me know if you need any advice! 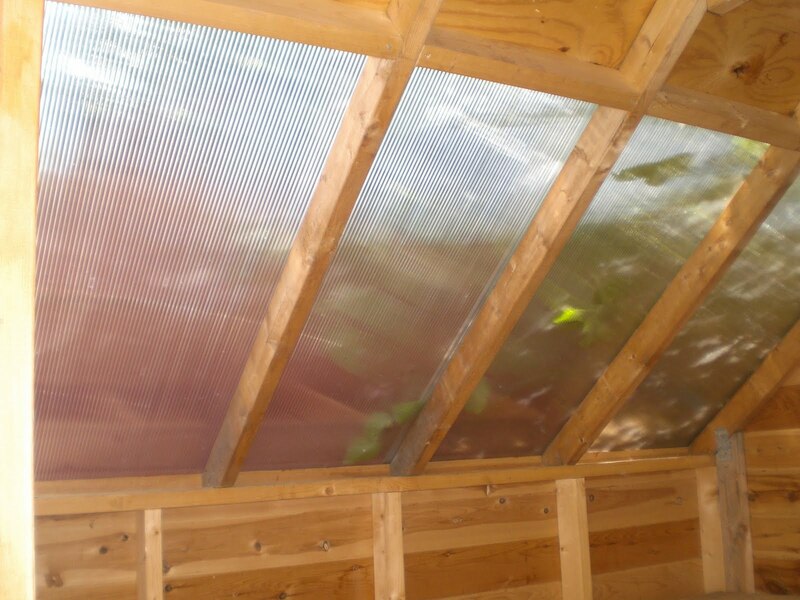 Love the idea of having a shed that doubles as a greenhouse - makes a lot of sense to me. How fun that you get to design your own, too! I love that door and it sounds like you'll have a dream of a garden shed! With the help of a friend, my husband built a workshop. Now if I could talk him into building a shed for me . . .but I'd want a door like yours! Check around for salvage businesses. I've seen green houses and sheds that were made out of mainly old windows and doors.